Place a small pan over medium heat and add pine nuts. Leave to toast, shaking the pan now and then, until nuts are slightly toasted and fragrant. This will only take a minute or two. Remove from heat. Pile toasted nuts, garlic, cheese and herbs into a food processor. Pulse until combined. Slowly add olive oil, while pulsing, until mixture turns into a smooth paste. Add sea salt and pepper to taste. Store any remaining pesto, covered with a fine layer of olive oil, in the a jar in the refrigerator. It will keep for up to a week. Heat a grill pan or barbecue over medium heat. 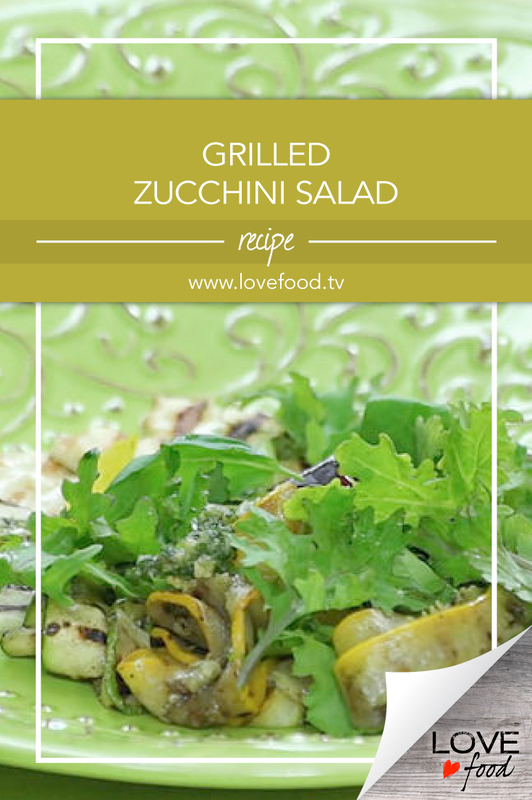 Brush the grill and sliced zucchini with olive oil. Season the slices with sea salt. Grill the slices for a few minutes per side, until soft and grill marks appear. Transfer to serving plate. Brush grill with a little more olive oil. Lay slices of halloumi on grill and cook for one minute per side, or until grill marks appear. Transfer to serving plate with zucchini slices. Top slices with a handful of fresh, mixed salad greens. Dollop a spoonful of pesto on top. Toss it together and finish with a nasturtium flower, if you have one!